Automobile accidents and trucking accidents frequently cause serious personal injury and wrongful death to thousands of people on our nation’s roadways every year. They are, in fact, the number one cause of death for those under the age of thirty-four. According to statistics released by the Florida Department of Highway Safety and Motor Vehicles, there were 235,461 auto accidents in Florida in 2010. Those accidents caused 195,104 injuries and 2,444 deaths. Read the full FLHSMV report. Too often, auto accidents, truck accidents, truck rollovers, tractor trailer accidents, and motorcycle collisions on local freeways result in severe catastrophic injuries or tragic fatalities. Don’t let the repercussions of your auto accident, such as mounting medical bills, expensive car repairs, and an unconcerned insurance company get you down. If you have been hurt in a car accident, you need an experienced auto accident attorney who understands the aggravations that result from being involved in an auto accident, and who will work to minimize your frustrations while maximizing your chances for a favorable settlement. A person who carelessly operates a vehicle may be required to pay for resulting damages to persons or property. 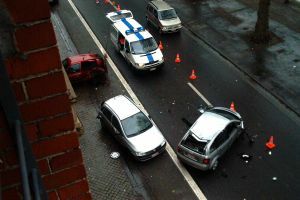 People who operate automobiles must exercise “reasonable care.” Failure to use reasonable care is the basis of most lawsuits pursued by a car accident attorney. Likewise, an owner of a vehicle may also be liable for the damages to persons or property that the person who they entrusted their vehicle with causes. To learn more about the importance of auto insurance and UM coverage, please watch our video, Auto Insurance and Accidents. Wayne Hogan shares an alarming statistic about uninsured drivers and how to protect yourself. Should the liable party not have sufficient insurance to cover these damages, a claim can be made against your Uninsured/Underinsured Motorist (“UM”) coverage under your own motor vehicle insurance if you have UM coverage. UM coverage is important coverage to have. Many victims and their loved ones are faced with devastating medical expenses or lost income, the recovery of which can only be obtained through a personal injury lawsuit with the assistance of a qualified automobile accident lawyer. If you have been injured, you should seek medical attention as soon as possible. If treatment is delayed, the defendant may argue that it was not his negligent conduct that caused your injury, but rather something that occurred between the time of the accident and your visit to the doctor. If you have been seriously injured in an automobile accident it may be important to contact an auto accident attorney who can help you protect your legal rights. Terrell Hogan’s automobile accident attorneys in Jacksonville will evaluate your case free of charge. In addition, you will not pay any fees or costs unless your attorney recovers money for you by judgment or settlement. To aid you in the event that you are involved in an auto collision, we have created a checklist for you to print and keep with you in your glove box, the Auto Accident Brochure.